On the 25th (Thu), take in panoramic vistas at Qutub Minar, take in nature's colorful creations at Humayun's Tomb, then contemplate the long history of India Gate, and finally see the interesting displays at National Museum. 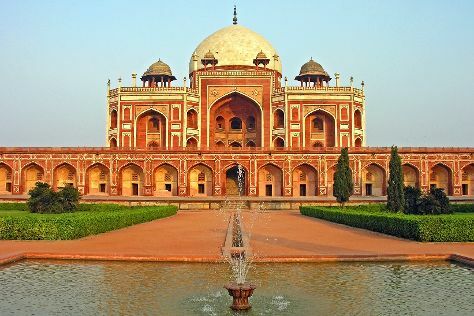 To find photos, other places to visit, and other tourist information, read New Delhi online tour itinerary planner . If you are flying in from India, the closest major airport is Indira Gandhi International Airport. In April, daily temperatures in New Delhi can reach 43°C, while at night they dip to 25°C. Wrap up your sightseeing on the 25th (Thu) early enough to travel to Bangkok. 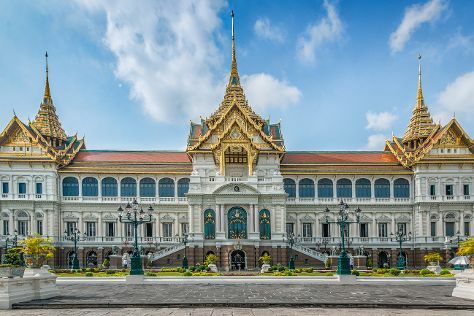 Start off your visit on the 26th (Fri): take in the spiritual surroundings of Temple of Dawn (Wat Arun), then explore the historical opulence of The Grand Palace, then explore the ancient world of Wat Pho, and finally take in the spiritual surroundings of Wat Saket. On the 27th (Sat), you'll have a packed day of sightseeing: see the interesting displays at Jim Thompson House, admire nature's wide array of creatures at SEA LIFE Bangkok Ocean World, and then shop like a local with Chatuchak Weekend Market. To find other places to visit, photos, maps, and tourist information, use the Bangkok tour planner . You can fly from New Delhi to Bangkok in 7.5 hours. Alternatively, you can drive. The time zone difference when traveling from New Delhi to Bangkok is 1 hour. Traveling from New Delhi in April, Bangkok is a bit warmer at night with lows of 31°C. Cap off your sightseeing on the 27th (Sat) early enough to go by car to Pattaya. On the 28th (Sun), make a trip to Walking Street Pattaya, kick back and relax at Pattaya Beach, then take in the spiritual surroundings of Big Buddha, and finally enjoy the sand and surf at Jomtien Beach. On your second day here, push the limits with an extreme tour, then admire the striking features of The Sanctuary Of Truth (Prasat Sut Ja-Tum), and then stop by Style'n'Style. For more things to do, ratings, maps, and more tourist information, go to the Pattaya tour itinerary planner . Traveling by car from Bangkok to Pattaya takes 1.5 hours. Alternatively, you can take a shuttle; or take a bus. While traveling from Bangkok, expect little chillier days and about the same nights in Pattaya, ranging from highs of 38°C to lows of 32°C. Finish your sightseeing early on the 29th (Mon) to allow enough time to travel back home.